Vertebrate-Type Intron-Rich Genes in the Marine Annelid Platynereis dumerilii. Florian Raible, et al. Science 310: 1325-1326. Species evolve at very different rates, and the evolutionary line that produced humans seems to be among the slowest. The result, according to a new study by scientists at the European Molecular Biology Laboratory (EMBL), is that our species has retained characteristics of a very ancient ancestor that have been lost in more quickly-evolving animals. This overturns a commonly-held view of the nature of genes in the first animals. Genes hold the recipes for proteins. The genes of animals usually contain extra bits of DNA sequence, called introns – information which has to be removed as cells create new molecules. The number of introns in genes, however, varies greatly among animals. While humans have many introns in their genes, common animal models such as flies have fewer. From an evolutionary perspective, it was long assumed that the simpler fly genes would be more ancient. The current study reveals the opposite: early animals already had a lot of introns, and quickly-evolving species like insects have lost most of them. To discover what early animals were like, scientists usually compare their descendents. This is difficult when comparing distantly-related animals such as humans and flies. In these cases, it helps to look at living organisms that have preserved many features of their ancestors. Detlev Arendt's group is doing this with a small marine worm called Platynereis dumerlii. "Similar animals are already found in the earliest fossils from the Cambrium, about 600 million years ago," Arendt explains, "arguing that Platynereis could be something like a 'living fossil'" This makes it an ideal model for evolutionary comparisons to find out what the common ancestors of humans, flies and worms were like." The discovery that Platynereis also represents a slowly-evolving branch of animal life has important implications for the study of humans. "We've already learned an incredible amount about humans from studies of the fly," Arendt says. 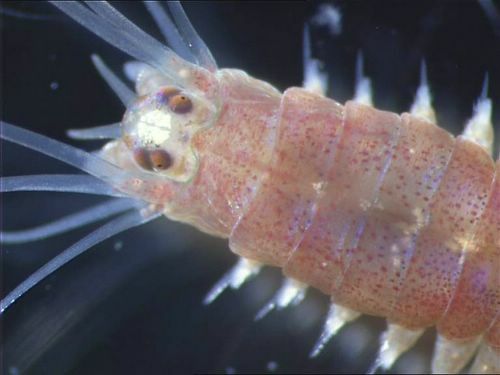 "The marine worm might well give us an even better look at important conserved processes. Another thing that this has shown us is that evolution is not always about gain; the loss of complexity can equally be an important player in evolution."